Press Release posted 8/25/16 – The #PinkPatchProject is a collaborative effort between the LA County Police Chief’s Association and over 30 law enforcement agencies throughout Los Angeles County and beyond. The program centers on vibrant pink versions of the agency’s uniform patches. Officers from the participating agencies, including SMPD, will be wearing these pink patches on their uniforms during “Breast Cancer Awareness Month” in October. The pink patches are intended to stimulate conversation within the community and to encourage public awareness in the early detection and fight against this disease. 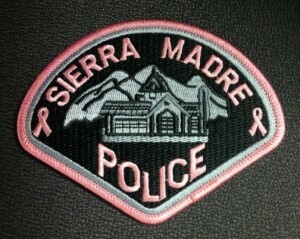 As part of this program, The Sierra Madre Police Department is now selling their pink patches to the community for $10.00, along with a commemorative pink patch T-shirt for $15.00. All proceeds from the sale of these commemorative #PinkPatchProject items will go to fund breast cancer education, research, and treatment. Pink Patches and T-shirts can be purchased at the Sierra Madre Police Department and at Mail Box & Postal – 80 W. Sierra Madre Blvd. and various events throughout the community.